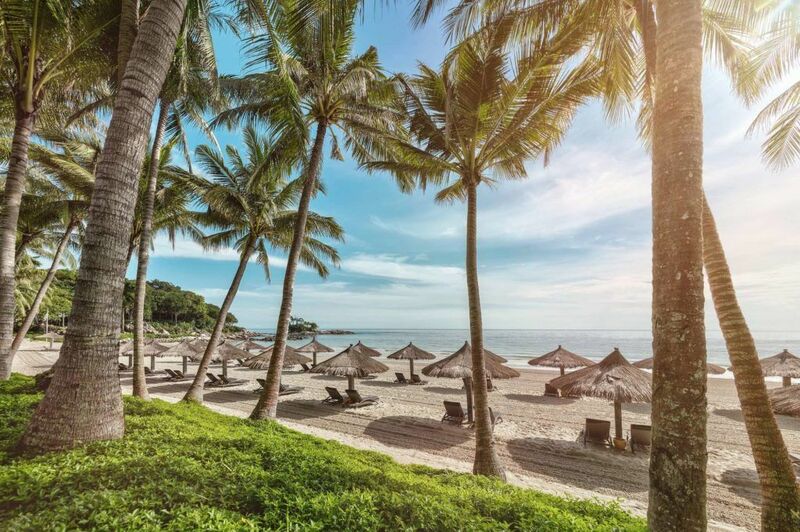 With the opportunity for relaxation, indulgence, fitness and wellness all on your doorstep, you can’t help but feel revitalised after a stay at Club Med, Bintan. After arriving in Singapore Changi airport at 3pm we hopped in a short, ten minute taxi to the Bintan ferry terminal. From here it’s an hour and a half journey to a slice of exclusive paradise tucked away on the Indonesian island of Bintan. Upon arrival at Club Med we were greeted by a small army of GOs armed with smiles, delicious iced tea and hot face towels. This is an appropriate taster for what is in store for a long weekend. After a light hearted (but subtly serious) warning to keep our balcony doors shut due to mischievous monkeys, we were escorted to our room to be reunited with our bags and prepare for dinner. We since found out that these cute intruders have a reputation for entering open doors in search for food, but will take whatever they like. Famished, It was now time to satisfy our appetites in one of the two restaurants on offer. There is the large restaurant within the main building and also a beach side restaurant with more of a private feel. Even with high expectations, the sheer variation of worldly culinary offerings and the quality of presentation and taste was a pleasant surprise. The service was second to none with the floor staff and chefs eager to please as we devoured a duck l’orange from the French section, followed by Vegetable curry and freshly prepared naan from the Indian corner, then a Spaghetti Marinara from the ever present Italian station. This was just the beginning. Our eyes had thoroughly outgrown our belly’s as we ate our way through Japan (Katsu Curry), China (an array of steamed dumplings), Korea (Pork belly) and the BBQ section all accompanied by a choice of salads. There is also an abundance of choice between plenty of deserts, fresh fruit and drinks. The wine and local Bintan beer were also favourites! To work off indulging your appetite the resort host a number of fitness programmes, such as morning group runs, beachside yoga, volleyball, beach football, boules, test your acrobatics on the trapeze, and to satisfy your competitive streak there are football, basketball, tennis, basketball and badminton courts as well as tournaments throughout the year in the modern sports facilities available to all. If strolling around the serene greens of Indonesia is more your thing, they have an award winning 18 hole golf course designed by Gary Palmer. If you would like to warm up there is a pitch and putt area and driving range within the grounds. Water sports are also provided on the private beach with sailing, kayaking canoeing, paddle boarding and windsurfing all inclusive and with the very attentive water sport staff on hand you can try these out no matter what level. If this all sounds a little stressful, there is no where better to relax than their two beach side pools, and the beach itself. Afterwards you may want a freshly squeezed fruit juice or cocktail from either the beach bar, pool bar or rooftop bar with panoramic views. As Club Med goes this must be up there as one of the top destinations. The nature, restaurants and ever-attentive staff were particularly highlights. Or call us today on 0845 528 0348 to speak to a Club Med specialist today!